What Is Hydrotherapy And How Effective Is It? Home / Blog / What Is Hydrotherapy And How Effective Is It? Hydrotherapy is a treatment that involves the use of water for pain relief. The term stands for a large number of approaches and methods that make use of the properties of water such as pressure and temperature to increase the blood circulation to specific parts of the body and thereby treat various diseases. Hydrotherapy is not a new treatment. There are records of it having being used in 4500 BC. It used to be integral to the Roman culture. It is currently used in sports medicine, rehab clinics and by physical therapists. Hydrotherapy is used around the world to treat a multitude of conditions which include headaches, acne, colds, arthritis, stomach problems, stress and sleep disorders. People respond differently to hydrotherapy depending on the intensity of the treatment and its duration. It is used by many to soothe inflamed joints and muscles and to promote the general physical wellness. In the present day, treatments make use of pressurized jets, mineral baths, underwater massages and more. The treatment is used as a means to deliver heat and cold to various parts of the body and seek to produce vasoconstriction and vasodilation. Hydrotherapy is widely used for the treatment of burn victims. 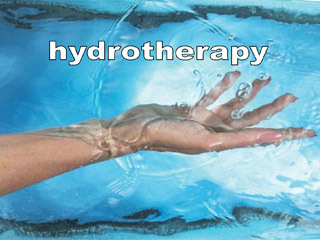 If you would like to know more about Hydrotherapy, its uses or its benefits, please feel free to get in touch with us. Hydrotherapy is available with us.